This should make it easy! Brakenjan wrote: This is Himatsubushi-hen - containing the first 4 arcs, the question arcs. And this is Matsuribayashi-hen - containing the other 4 arcs, the answer arcs. Then you may also want Rei, which can be found here which contains three extra arcs. So >> Sonozaki Futago-tachi (aka Mion and Shion?) << are currently almost finished with Onikakushi-hen or the first of the four arcs of Himatsubushi-hen. The easiest and cheapest way is to download the demo from this site. Don't worry about the Japanese - the download mirror sites are at the bottom of the page, so scroll down and follow the directions in English for which mirrors to use, labeled "みら〜#?. You might have to right-click and select 'save link' if it doesn't automatically begin to download the .exe file. Sorry for offtopic, I don't have much interest in the game, but HOLY CRAP. That is awesome. OFFICIAL SANCTION. See? Japanese are so ahead of us, they can even recognize how important things like this is. I'll be they gain a HUGE popularity boost from this. Not just the translation, but the fact they SUPPORT IT. For some reason if that is getting an official translation I'm expecting that this will be avialbe in US online stores now. Heck this would mean the beginning of official Visual Novels in the US if this actually pays off. Kid-Wolf wrote: For some reason if that is getting an official translation I'm expecting that this will be avialbe in US online stores now. Heck this would mean the beginning of official Visual Novels in the US if this actually pays off. It's not an official translation. Pretty much this guy who did the Higurashi series was the only one to do a Visual Novel all by himself from what volume one of the manga mentions. In any case I think he is thinking if people outside Japan like my work then why not. Besides if that was the case I'm sure it would be a good thing on the sales he might get with the game being sold intrantionally. I remember LoSs (or at least I think it was him...) mentioned that in MM's IRC channel some days ago. It would be nice if this started a trend of other developers supporting fan translators. From my (little) experience, fan-translators tend to do a better job than companies. 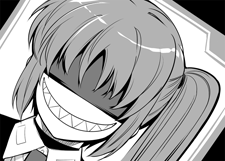 Anyway, since this is a Higurashi thread, I read that the guys working in Higurashi are still at it, even if they haven't updated their blog. We know it's been taking a long time for this final installment, but we hope you can be patient just a little longer. We've finished translating and adapting through to the end of day 15 and the extras that come after it, so the final release of Onikakushi is almost ready! Best news ever. One of my many dreams was a chance to play every Higurashi game and understand it. Looks like it's coming true, been a fan of this series for quite awhile. They finished the first arc on Jan 31. This is some happy times Need to listen to Smile Happy Peace now. All companies should be like this. This allows the their games to go to a wider audience, and then more people will buy their games. solopy567 wrote: All companies should be like this. This allows the their games to go to a wider audience, and then more people will buy their games. I agree with you. Man how I wish they would bring some of the things they only keep in some countries to others. Like Melon soda or Milkis and other type of products. Why must they remain a one country thing, we should share the cool things. Man how I miss Milkis, I will never forget thee. ...it's still not an 'official translation', it's just a fan-made translation which the original Japanese writer has given permission to continue/exist/etc. Unlike, say, EVER17... which has an official translation and is/was sold in America. Although if you think about it sometimes a fanmade translation can be a good thing since they can always do bug fixes, and fix any grammar mistakes as well. While if it was done profesionally they can even muck it up as well. I mean I noticed a few mistakes when I was playing Princess Waltz which a few were very obivous. When a professional group does that it shows to me that they just want to push it out into te market as fast as they can. As for a fan-made it gets done when they think it will cause little to almost no problems at all. I know that, I just think it nice of the company to give them a letter like that. Something like we will be watching over you and stuff like that. I fig. they would complain or something in that manner for "hacking". Anyway I was meaning that they should give translators that work for free some support. This could help there sales in the long run. This might also might help them in the thought of bringing something they have over there over here. One day they will have things like mangagamer that let you download the game like when they cry, but in different lang for everyone to enjoy. I believe Mangagamer has the support of the companies. then maybe it's time for them to relinquish those supports to other translation groups that can actually translate. i'm sorry, but after edelweiss and hinatabokko, and then hearing they're gonna do dc and suika... no. just no. Da Capo is out. Supposedly with a lot of proof-reading and stuff, as they did hire lots of people. I hear they will re-do Edelweiss? NonExistence wrote: then maybe it's time for them to relinquish those supports to other translation groups that can actually translate. i'm sorry, but after edelweiss and hinatabokko, and then hearing they're gonna do dc and suika... no. just no. Was it that bad? I never bought anything from them yet, but I was thinking about getting D.C since I like the anime. (I didn't like the main char decisions though) Anyway I can't wait till When They Cry fully translated patch comes out. Has anyone played Rena's mini game? I can only get though one punch before game over. I also love the Rena pun story. It's becomes very funny near the end.